Rocky Mountain Air's Original Compact Portable Air Cleaner for Removing Dust, Light Odors, Mold, Bacteria, VOC's with 6-Stage Filtration System with HEPA, Carbon, Germicidal UV Light, Germ & Odor-Killing Ions & PCO Technology & Ozone-Free, with Fast 350 CFM Airflow and Up to 3500 Square Foot Coverage! Best for: Reducing Allergies, Asthma, Light to Moderate Household Odors, Improving Overall Air Quality in a Home or Office. Not Intended for Smoke. For Smoke, choose the Summit Plus. New ULTRA-QUIET Sleep mode now quiets the fan as well as dims the LCD Display allowing a more restful sleep. The Cloud home air purifier is Rocky Mountain Air®'s ozone-free offering, built utilizing an advanced six-stage filter design. Each phase of air purification is designed to provide you with multiple layers of protection against allergens in your home, such as pet dander, mold, mildew, pollen, and dust mites. By eliminating an amazing 99.9% of airborne pollutants, the Cloud brings fresh and clean air into your home or office! The secret to the effectiveness of the Cloud is the combining of HEPA, Carbon, Photo-Catalytic (PCO), and Ionic filtration with Ultraviolet sanitation to eliminate even the toughest airborne contaminants. With the Cloud, you can bring hospital grade HEPA and Ionic filtration into your home to stop the spread of bacteria and viruses, keeping your you, your family or co-workers safer in the process. Even lingering odors are no match for the Cloud's air purification system, as both Activated Carbon and Ionic filters work to absorb and break down unwanted smells from sources like litter boxes. 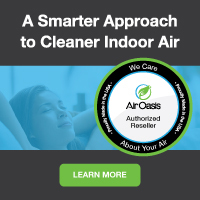 In fact, we are so confident that you will love your Cloud portable home air cleaning system that we back each unit with a 60-day money back guarantee! We know your family will love the fresh, crisp air that Rocky Mountain Air® provides! The Cloud is Rocky Mountain Air's original highly-successful multi-stage air purifier and represents an excellent portable home and office air purifier value, with 6 stages of odor, particle & germ-eliminating filtration, compact size, large room coverage and affordable price. Order your Rocky Mountain Air Cloud Air Purification System here at a discount online sales price and enjoy truly cleaned and sanitized air in your home or office!